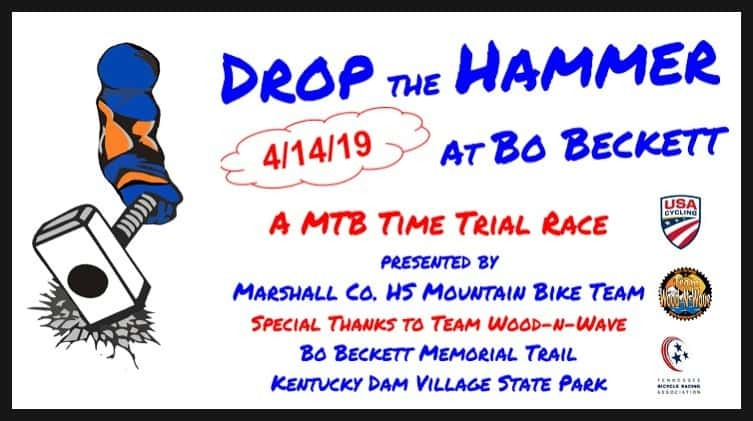 Drop the Hammer mountain bike time trial race presented by the Marshall County High School Mountain Bike Team takes place on Sunday, April 14. The race will be held at the Kentucky Dam Village State Park trail (Bo Beckett Memorial Trail). On-line pre-registration is open now through 5:00 p.m. CST on April 13. CLICK HERE to go directly to the on-line registration site. Race day registration will be open from 9:00 a.m. – 10:30 a.m. before the first race. This is a USA Cycling sanctioned event and MTB TT points will be awarded for all TBRA categories. Come test your skills and speed on this tight, twisting and exciting course along scenic Kentucky Lake. The community is invited to come enjoy the racing Sunday and join us for lunch at the concessions located in the Kentucky Dam Marina parking lot. A bike skills clinic followed by a fun ride will take place on Saturday, April 13 at a cost of $20.